RK2 Filtration Systems Are designed to be both a biological and particulate filter in one. Creating quality water low in nitrates, suspended particulates, dissolved organics while enriching the water with oxygen. Water that enters the filtration system flows through fluidized sand cultivating not only aerobic nitrifying bacteria, but also facultative anaerobic denitrifying bacteria. This means they may have the capability to remove not only ammonia and nitrite, but also nitrates. 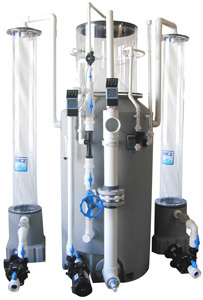 Once the water exits the fluidized sand filter it enters into a protein fractionator which removes suspended particulates and dissolved organics and injecting oxygen back into the water before returning to main aquarium or reservoir.